If you are like a lot of other real estate investors I've met, you have probably given up on finding real estate investing websites that work; websites that bring in leads on a regular basis. If that sounds like you this is your lucky day, because I have a solution to your problem! I wrote a review of Oncarrot a while back about my new real estate investing website and how much I liked the Oncarrot system. If you missed that post you can get all the details by CLICKING HERE. Ready to Get Rid of Your Lame Website? Today I want to show you just how easy it is for you to put this website to work for you in your business. In the past, when you got a “done for you” website they were pretty bad in most cases. What was even worse though was the fact that you didn't have the ability to customize them in any way except for some small tweaks like the header. Once again you could only choose from the few selections that were available to you. Oncarrot has changed all that by building their sites on a WordPress platform. This is huge. What this means is that anyone with even a basic knowledge of WordPress can jump right in and give this website the custom look you want for your business. What If You Don't Know WordPress? No problem. The website can be used “right out of the box” so to speak. You just need to add a few details like your phone number and city you invest in. You do that in the initial set-up. I'm not kidding when I say you can have your website up and running in just a matter of minutes. When you are ready, there is a whole section of videos to help you do any customization you decide to do. I would give Oncarrot a solid 4.5 out of 5 stars. Most of the things that I don't like about the website are cosmetic. The functionality of my website is great. In this day and age, your website is your business card. It's no longer optional to have a professional website; it's a requirement for anyone in business. You can be sure your website is the first place motivated sellers look for “validation” that you are the right person to solve their problem. You can get your own lead generating real estate investing website today by CLICKING HERE …..
Do you also operate in South American countries such as Peru? that my other site did in the entire 3 years. Not only did it produce more leads, they are a much higher quality lead. Also, their customer service is unmatched by ANY other business regardless of what industry it may be. I have been investing in real estate since 1971. This is as good as it gets folks and they continue to improve on it. I love Oncarrot Richard. And yes, there customer service is great. I interviewed Trevor Mauch several times in the past few years. We mostly talked about entrepreneurial topics. what is the cost ? any monthly pay as you go plan ? The basic plan is $49 a month. That included 3 websites and a whole lot of training. There is a plan that costs $99 a month called the content pro plan. That is the one I recommend everyone get if they can. They write blog content for you and you can just add it to your site. It really helps your site get ranked. This is a very nice article and gives in-depth information about real estate websites.Thanks for this nice article, which is a really good to read. You should check into it. I love this company. No they don’t Walter. The sites are so cheap that there is no discount that I’m aware of. Affiliates pay the regular price that everyone else does. It’s a great product I can tell you that. I may go for this, thanks again! Walter – Trevor Mauch has been around forever. He is an investor in Oregon and an all around great guy. He has developed a product that he uses in his own business. 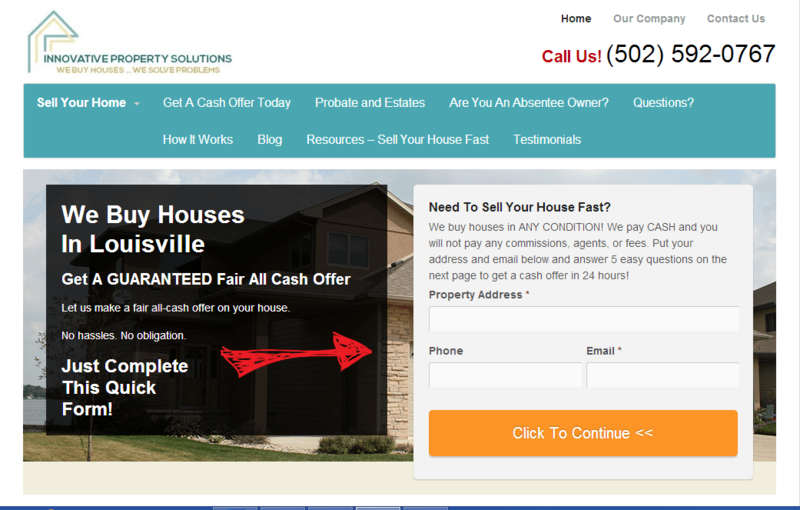 These sites can be customized for motivated sellers, rent to own. to attract private money or for any other niche. You can have the site up in 5 minutes, then go back and tinker with it. What can I say about “red”; it’s just not my thing. LOL Actually though, there is a reason they do everything on that site; the colors, placement of things etc. That’s why I have them. They know more about it than I do. Give it a try. You will love it.